Hello! Ever since Tinker Bell and the Lost Treasure was released on DVD, Sabrina has been in love with everything Tinker Bell. We also added the first Tinker Bell movie to our collection, so we've been alternating between the two. They are both very sweet stories. 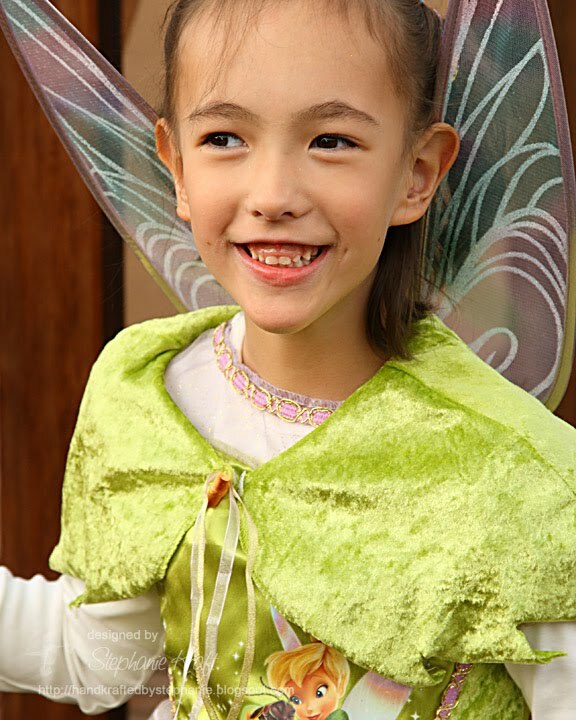 I can totally see how Sabrina relates to Tinker Bell -- they are both sweet and sassy! My card today combines a couple of challenges. First off, I used Karen's Sweet Sunday Sketch #44 for my layout. I'm also playing along with JUGS7, which is a technique challenge to use dry embossing. After I started my card, I realized there is also a JUGS twist to make a birthday card. I had already decided that I was going to make a Tinker Bell card for Sabrina, but it's not her birthday... then I realized her 1/2 birthday just passed... on 11/14, she is officially 6-1/2 years old! 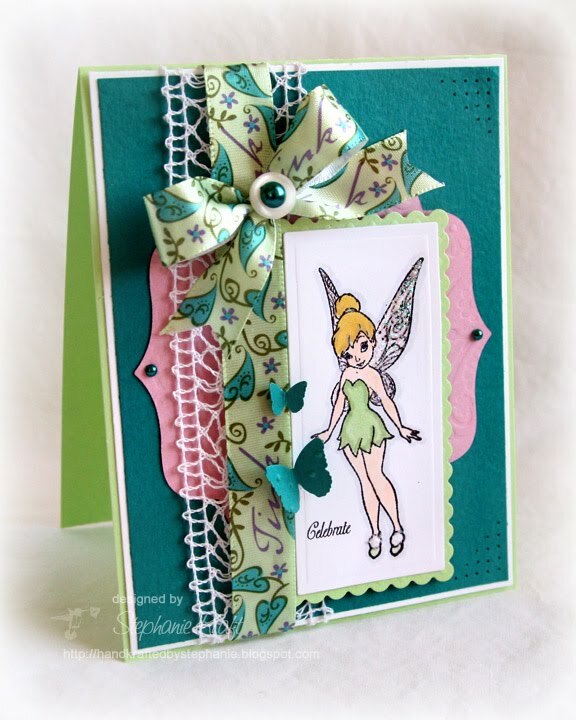 My image of Tinker Bell is one of a few fun ones from Disney's Tinker Bell clear stamp set. I colored her with Copic markers, added Star Dust Stickles to her fairy wings and Polar White Flower Soft to the tops of her shoes. It's hard to see, but I dry embossed my lavender moon panel with Butterflies Impressabilities. I also dry embossed the butterflies with Swiss Dots. The Tinker Bell ribbon is from Michael's. Accessories: Long Rectangle, Scalloped Long Rectangle and Labels Nine Nestabilities, Butterfly Impressabilities (Spellbinders); Swiss Dots embossing folder (Provo Craft), Butterfly punches (Martha Stewart), Markers (Copic), Star Dust Stickles (Ranger), Polar White Flower Soft, Ribbon (Michael's), Button (Papertrey Ink), Pearls (Basic Grey), Crochet Lace (May Arts), Paper piercer, Foam tape. Thanks for playing along with Just Us Girls this week! Hope to see you again on Saturday for our fun color challenge hosted by Lisa! Such a cute card and what a darling pic of Sabrina! I haven't seen the new one yet. Guess I'll probably just buy it. My 2 year old saw your "tickle-bell" and loved her - now she says "I'm flapping my wings" :). This is a beautiful card -- great layout, and perfect accents! Thanks for taking the time to play with us at the JUGS challenge this week -- hope you'll be back to play along with us again on Saturday! Stephanie this is just totally adorable - love the paper and the lace and the butterflies and of course, Tink - she's my fave! Thanks SO MUCH for playing along with Just Us Girls again. We love seeing some “regulars” come back each week! Hope to see you again on Saturday for our next challenge! Firstly - need that ribbon! Secondly - need that card as well. My daughter, although only very young, LOVES Tinkerbelle!